Having a rough weekend, I decided to pretty much just hide away with a book. I have owned Lessons from San Quentin for quite sometime (I'm talking years), but I have to be honest…One reason I have never picked it up, was because of the religious base behind it. I am not an overly (if really at all) religious person and honestly, the thought of reading scriptures and whatnot just doesn't "do it" for me. For whatever reason and although reluctant, I decided to finally give it a read. This is a book you will want to sit down with a highlighter – This isn't a one time, put back on the shelf, read. This is a coffee table book. One you'll want to reach to when you are feeling down. A book that is truly empowering with it's words that although I felt this was more preaching then a "deeper-look" into (San Quentin) prison I had hoped for, there was definitely a level of comfort that came along with it. The questions it asked and that I silently answered. Being at a low point in life and when you have no one to turn to for that lending ear or shoulder to cry on, I could have used another 100 pages. We all have these types of days, sometimes even months. Sometimes it's just a rut where we cannot pull ourselves out of. It's nice to turn to a silent ear in the learnings from Lessons from San Quentin. Disappointed that I have taken so long to open this inspiring novel. Highly recommended!! 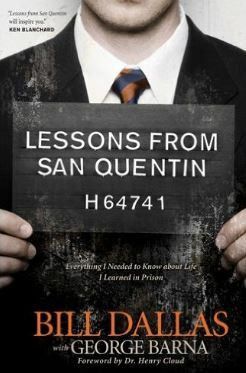 Lessons from San Quentin is available from amazon.com or amazon.ca – Enjoy!! 5 out of 5 Fingerprints – YES!! A Must Have, Must Read!! 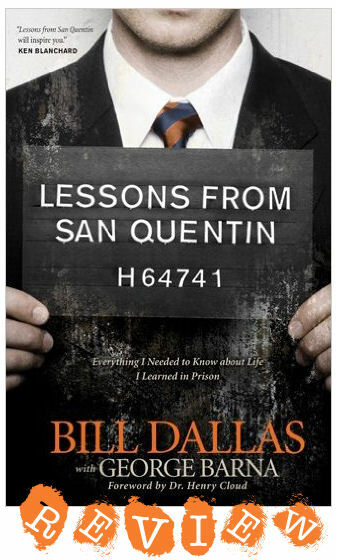 This entry was posted in Book Reviews, Positive Living and tagged Bill Dallas, California Prison, California Stories, George Barna, Lessons from San Quentin, Non Fiction, positive living, Prison, Prison Stories, San Quentin, San Quentin Prison, Spiritual.